One of the things I hope to have the opportunity to look into during my fellowship at the University of Washington is the use of digital media in the field of diplomacy and foreign affairs. I had arranged some appointments at the State Department when I was in the USA a few weeks ago. Sadly, I was blown of course by Hurricane Sandy and these meetings had to be postponed. However, I did receive some very useful feedback through email and telephone contacts. Richard Boly, the Director of eDiplomacy at the State Department, kindly pointed me in the direction of a fascinating study on eDiplomacy that was published recently by Fergus Hanson from Australia’s Lowy Institute for International Policy. Through a fellowship programme with the Brookings Institution in Washington, Fergus had unprecedented access to some of the key figures who have been working on digital diplomacy in the State Department, including Alec J Ross (Hillary Clinton’s Senior Advisor for Innovation). Although the USA’s digital media initiatives in the field of public diplomacy have received more public attention, I find some of the knowledge management initiatives implemented by the US State Department (for example, their internal wiki Diplopedia or their Corridor platform for in-house networking) equally impressive. The use of digital media as a tool for diplomacy and foreign policy is also catching on in Europe. We all have seen how the Internet has promoted social and democratic reform. It has put power in the hands of people. Less than two years ago, social media opened our eyes to what was happening and what we have come to call the Arab Spring. Young people could send us news from the ground through Twitter, Facebook or YouTube. 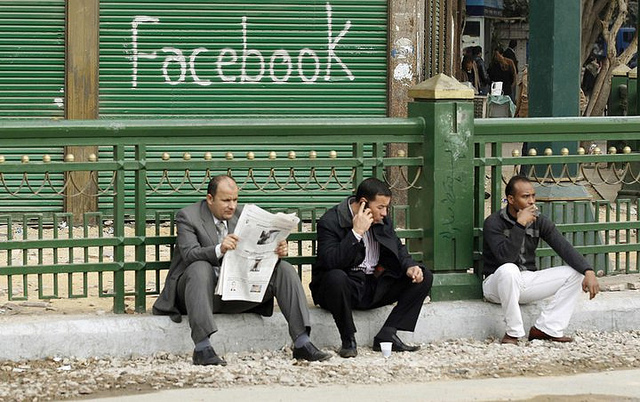 Social media did not topple these regimes. People did that. But access to the internet and technology changed the means and speed by which change was brought about. Every day hundreds of hours of video clips from Syria are uploaded on You Tube – making sure that human rights violations there do not go unnoticed, despite the attempts of the regime to seal off the country. The European External Action Service (EEAS) has established a presence on Twitter, Facebook and Flickr. Twitter is used mainly to share statements from Catherine Ashton, the conclusions of Councils and other official meetings. The content posted on the EEAS Facebook page is more visual and the tone more conversational. The EEAS has recently begun to use Storify as a platform to pull together content from different sources around major events, such as the United Nations General Assembly in September or the EU-Egypt Task Force in November. And many of the EU’s 140 delegations around the world are also using social media. Remarkably, thanks to the efforts of the press and information team in the EU Delegation to China, Herman Van Rompuy is now one of the most popular foreigners on Chinese micro-blogging service Weibo (with over 1.4 million people following his Weibo account!). The EU Delegation to China’s own two weibo on platforms Sina and Tencent have about 500,000 followers. Other EU Delegations that are making active use of Twitter and other social media include Washington (accounts of the Delegation and its Head, Joao Vale de Almeida), Lebanon and the Delegation to the UN. Famous tweeting foreign ministers from EU countries include William Hague from the UK and Carl Bildt from Sweden (both of whom have over 100,000 followers). Antonio Deruda, who worked for six years in the US Embassy in Rome, has published a book on “Digital Diplomacy, Foreign Policy and Social Media” and also blogs about digital diplomacy. Antonio recently spoke in the European Parliament at an event hosted by Debora Serrachianni, the most followed MEP on Twitter. Antonio stressed the growing importance of digital media tools, but also argued that these complemented rather than replaced traditional channels and methods. In Antonio’s words “the handshake remains the most important tool of diplomacy”. So, what does the future hold? Will the USA continue to drive the use of digital media as a foreign policy tool after the end of Hillary Clinton’s term as Secretary of State? Watch the video interview below between Fergus Hanson and Alec J Ross for some insights into the likely future of digital diplomacy, both in the US and globally. Reblogged this on the young blog. I believe it’s time to go beyond the so-called “twiplomacy” — or the use of social media in diplomacy — and explore the new frontiers of ediplomacy. It’s key to empower the full potential of mobile technologies, crowdsourcing, virtual communities… I think social media is only the most visible part of ediplomacy: much more is still baking in Washington and all around the world. Pingback: ‘LHL’ leading Singapore by example on social media!